We’re giving away a bunch of pairs of passes to see Top Five at the UA King of Prussia. To enter, send us an email with your full name and address and tell us which is your favorite Chris Rock role. Winners will be chosen at random, only one entry per household please. Written, directed , and starring Chris Rock, TOP FIVE tells the story of New York City comedian-turned-film star Andre Allen, whose unexpected encounter with a journalist (Rosario Dawson) forces him to confront the comedy career—and the past—that he’s left behind. 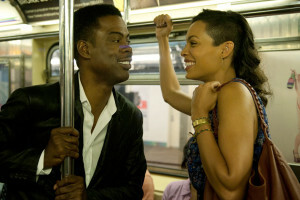 Starring Chris Rock, Rosario Dawson, Gabrielle Union, Cedric The Entertainer, JB Smoove, Tracy Morgan, Kevin Hart, Anders Holm, Jay Pharaoh, Michael Che, Sherri Shepherd, Leslie Jones. The film is produced by Scott Rudin and Eli Bush. The Co-Producers are Shawn “Jay Z” Carter and Kanye West; the Executive Music Producer is Questlove. New jack city, I also like im going to get u sucker, but those are classics. . I actually liked his character in longest yard (caretaker)..